When you’re looking for some retro slot machines play, look no further than Blazing Star. This slot game, by Merkur, draws its inspiration from the transitional period of the ’90s when games were moving from simple mechanics and graphics to the video slot machines we know and love today. Blazing Star lives up to its name with graphics so bright you’ll have to wear shades. Blazing Star doesn’t have much in the way of a recognizable theme, much less visual interest outside of the brightly colored fruit graphics and bright white sun icons. It’s a five-reel slot with five paylines that provide standard play. The gaming screen consists of a wide yellow border that fades to dark yellow at the top and a black background for the icons. This represents the sun and surrounds five slot reels. 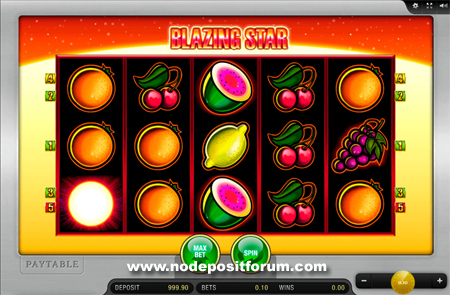 Supposedly, the name of the slot machine and the sun graphics represent the concept of the game having a space theme. Icons consist of classic fruits that hearken back to the early days of slot machines. Sliced watermelons, lemons, plums, grapes, oranges, and cherries are accompanied by the graphic of a blazing sun (star). Numbers on either side of the reel screen denote the five paylines. Blazing Star is a straightforward slot machine that doesn’t offer much other than the opportunity to press the spin button and hope for a winning line or two. The graphics don’t have a lot of detail, and about the only interest they offer is the retro design that makes one think of old mechanical reel games that used fruits for their icons. Press the play button to set the reels spinning and listen to the reels as they make a clacking sound, accompanied by random notes that play while the reels move. Buttons at the upper right-hand corner of the screen give you menus that lay out the value of each icon and the payout that is given for multiples of the same icon landing in a line. The “I” button pulls up a screen that provides information on what the player return percentage is, the game’s rules, and how the game operates. A speaker button toggles the sound on or off. Bets are made at the lower left-hand corner of the screen, and autoplay/play is found on the right-hand side of the screen. There are no extras in the form of Scatter, Wild, or Bonus symbols. What this means for the player is a lack of incentive to play for higher stakes. The game doesn’t double the wins, has no free spins, and offers no bonus games to increase the payout. The star is the odd icon out and pays the most out of all the symbols. A winning line of five stars pays 1,000 times the bet, but it won’t unlock anything else in the game, as there’s nothing to unlock in the first place. Blazing Star doesn’t offer much in the way of interesting gameplay. It won’t keep the interest of experienced players for long. Novice players may find the game helps them learn the mechanics of a five-reel slot with multi-line payouts due to its straightforward icons and lack of distractions. But even the beginner player will want to move on to more challenging play as Blazing Star has little to offer them after a while. Ultimately, Blazing Star is a game that lacks mechanics and won’t keep a player interested for very long. But it might be of value to a beginning slot player or offer a break from more complex play for experienced players. Mr Green Casino has games by Merkur. Give this slot a spin and see why Merkur gaming is all the rage!